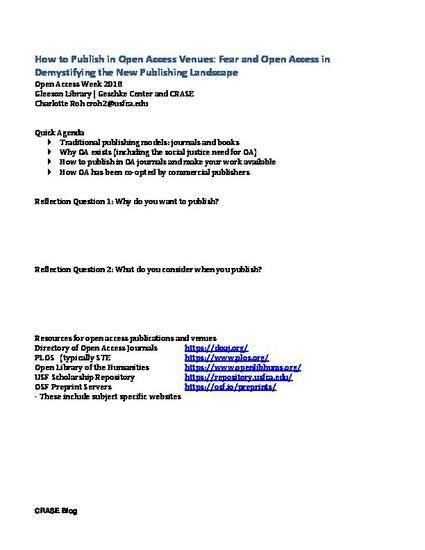 This is the handout that accompanies the interactive workshop for Open Access Week 2018 at USF that addressed the fear and uncertainty around open access to demystify the new publishing landscape. It covered traditional publishing models, why open access exists, and how to publish in open access journals and make your work available to the world. Organized by Gleeson Library | Geschke Center in collaboration with CRASE, the Center for Research, Artistic, and Scholarly Excellence. Please also see the slide deck at https://works.bepress.com/charlotteroh/45/.